Stephen Morris was born in Solihull in 1957 and grew up mostly in the West Midlands. 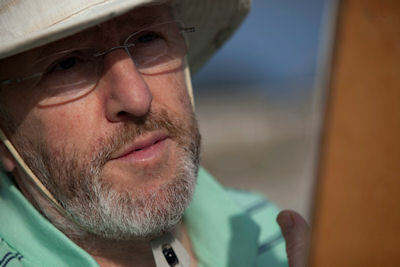 Since his teens, Stephen has been passionate about both painting and food. He initially trained in hotel management at the Birmingham College of Food in Summer Row and achieved full membership of the H.C.I.M.A. 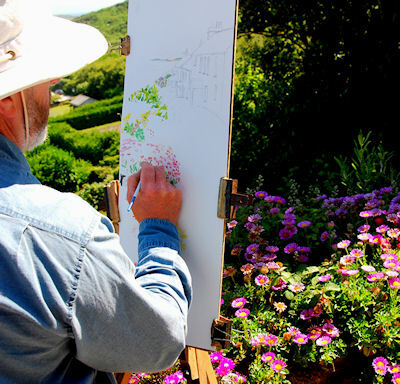 After a successful career spanning twenty five years in catering, both as a hotel manager and running his own guest house on the Isles of Scilly, he changed direction in 1999 to concentrate on his art. Many who view his work say that he paints in a similar style to his late aunt - Nan Heath, a respected and successful watercolour artist and member of the Staffordshire Society of Artists, who had exhibitions in both Staffordshire and Scilly and whose work is still very popular. However, Stephen has his own unique style and quite early on adopted a narrower format which can be used horizontally or vertically. 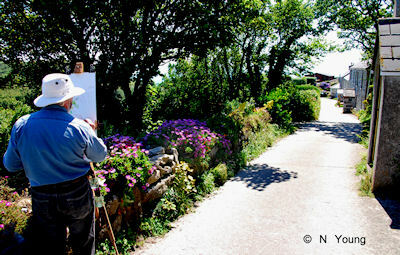 Like Nan, he paints 'en plein air' because he feels that it captures the immediacy and freshness of the Scillonian landscape. He is strongly drawn to colour, occasionally painting well-known island views but choosing a different, perhaps unusual, perspective. Stephen prefers the traditional use of watercolour to produce sweeping atmospheric skies and sea without using body colour. He does use a similar palette of colours to Nan but tends to be bolder and mixes his media with the addition of inks and pastels. In the past, he experimented with a range of different media from oils to pastels, inks to charcoal, on projects like murals and large works. 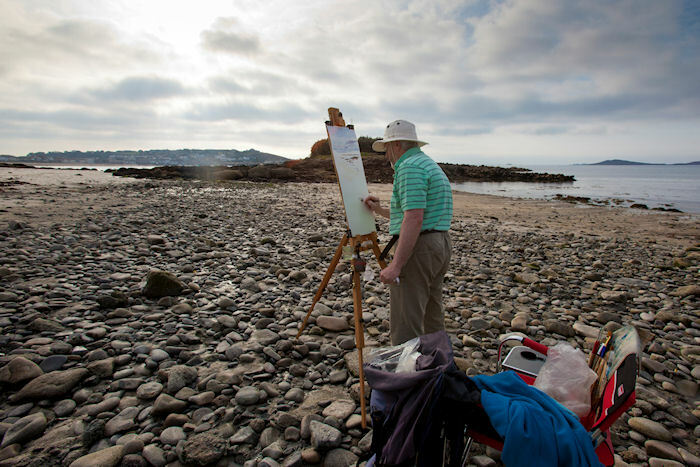 When painting on the beach, he uses sand, stone, shells, seaweed etc., combined with the watercolour. 2003 saw his first Solo Exhibition, held at the newly-refurbished St. Marys Hall Hotel on St. Marys, Isles of Scilly. Stephen particularly wanted to have his first Exhibition on Scilly and was pleased that the majority of original watercolours were acquired by islanders who, perhaps, do not often have time to visit Glandore Gallery where his work is displayed. Following an invitation from the Madrid based Galleria de Arte Gaudi, Stephen exhibited 10 paintings in France as part of their major exhibition at the Lille "Artevent" (European City of Culture 2004). His watercolour paintings were also displayed at the Galleria de Arte Gaudi in Madrid. Glandore Gallery's range has now increased to sell a range of Stephens cards, lithograph prints and more recently self-produced giclee prints which have proved to be very popular. The Gallery now occupies most of his time - painting original watercolours, producing the Gallery's range of giclee prints and meeting customers. The production of giclee prints released him from the pressure of demand for his originals and enabled him to think once more of exhibiting elsewhere. He particularly wanted to have his first UK mainland exhibition in his home city of Birmingham, so was delighted when the Gallery of The Birmingham Botanical Gardens accepted him for a rare solo exhibition entitled Scilly Seasons for four weeks in April 2009. Two year later, he was invited by the Gallery Manager to return to the Botanical Gardens for a second month-long solo Exhibition which took place in October 2011. This one was entitled Islands of Sun and Ice and showed watercolour and mixed media paintings both of Scilly as well as a small selection of acrylic ink sketches done on location while visiting Iceland in November 2010. Five original watercolours were also accepted for the Gallery Tresco Spring Exhibition in early April 2013. On impulse in summer 2013, Stephen entered one of his paintings in the Artist of the Year 2013 competition organised by "Artists and Illustrators Magazine". He was very pleased to find that 'Amethyst Sunset' was shortlisted as one of fifty artworks for the final stage of the competition. In January 2014, he attended the Competition Exhibition at the Mall Galleries in London where his painting was exhibited with all the other shortlisted artworks. In recent years, Stephen has been developing a more impressionistic style using the inks. As before, he is painting exclusively from life but has now abandoned pencil and brush work, painting instead with pipettes and mixing colours directly on the paper. This work has an enhanced vividness and vibrancy. Unfortunately, since this style is very loose and immediate, about half the paintings he starts do not succeed. However, when they do, they are dramatic and very exciting to paint! Website and contents copyright © Glandore Gallery - created by L. A. Morris March 2001 - 2013.